If you have been following up with Singapore’s property markets over the past year, there has been mainly one specific trend: recovery. Singapore’s recovery across the various markets, and particularly the office and residential markets has been phenomenal. Notwithstanding that, the retail market is still in a slump, although this presents an excellent opportunity for tenants to jump in due to the low rents. All-in-all, this is a great opportunity should you be looking for rental opportunities throughout the sectors. 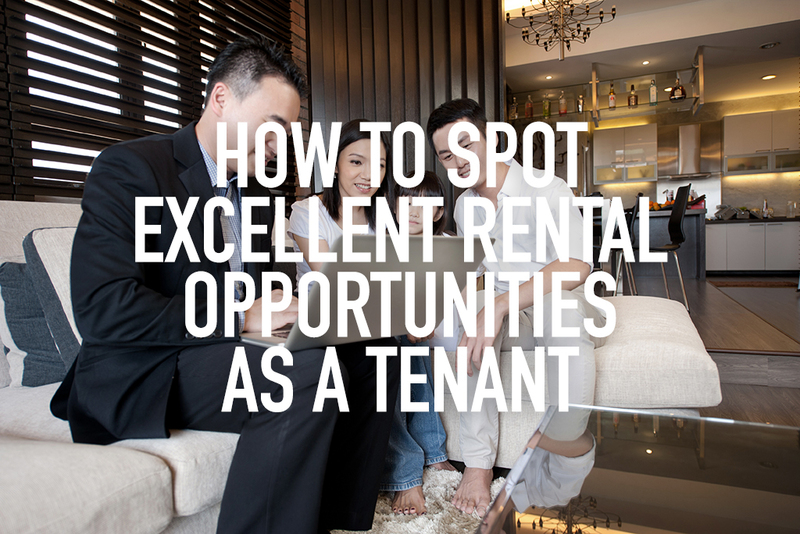 However, how do you spot an excellent rental opportunity? Well, the answer is simple: landlords. It is all about reading the landlords’ behaviour. Have you taken a look around your neighbourhood? Did you notice ‘For Rent’ pamphlets and signs around your neighbourhood (at void decks, lifts, walls, etc)? What about newspapers, magazines, social media, the internet? As you can see, indeed, there are there are plenty of them. Well what does this smell like? It’s an opportunity. Clearly the first step to understand here is that they need prospective tenants like you. They need you, thus, the need to advertise their vacant slots. Indeed, there are instances where a tenant can actually turn the tables totally on the potential landlord. That is what is happening right now; it is the tenant’s market – meaning the situation is skewing in favour for tenants. This is mainly due to the simple concept of demand and supply. When the supply of rental space exceeds the demand for vacancies, this is the time where tenants get should be aware of the potential chances they can capitalise on. At this point of time, a number of landlords would be desperate as they combat with oversupply and competition. The general consensus right now is the fact that tenant-landlord relationships are a 2-way affair. However, in reality, landlords are usually more passive when marketing their vacancies. This is due to the fact that people are always in need for spaces to work, to live, to rent. As such, they (the tenants) will actively seek available rental spaces for their own businesses. As such, if it is indeed the other way round, there is a tendency that the tables have turned. Indications which suggest that rental property owners are in need of tenants would be the presence of listings in all sorts of media channels. After actively placing adverts, what actually happens is that they will wait for that call from genuinely interested parties or from the agencies they hired. As such, if you find that landlord is calling you to ask for an offer before you indicate any real interest, it says a lot about how much he/she needs you as a tenant. When this occurs, be aware that this could be your opportunity to realize your upper-hand in negotiations. Now this happens during the contact with the potential landlord. Clearly at this stage you have seen what the rent is going to be and you find that the asking price is affordable. However, as mentioned earlier, you sense that the ball is in your court now; there is room for negotiating for lower rental rates. Ask questions, show your genuine interest for the place. Landlords know when they have someone who is going to take good care of their apartment and thus they don’t want to lose them. As such, if this happens, what they may do is start lowering the rent for them. This is one way to know that indeed, you’re desired as a tenant. Of course, landlords generally do have a preferred profile for their tenants. For office spaces, there is a kind of criteria or even level of prestige that landlords prefer to have as this may affect their image. On the other hand, for residential properties, it varies a lot; some may like students, some may like retirees, foreigners, singles, etc. However, all-in-all, every one of them wants someone who carries out his/her obligations as a tenant properly. Anyway, if you are being offered a discount while focusing a lot of interest on the property, you can probably tell that the owner prefers to rent to someone like you. At this point, his/her decision making process has entered into the emotional state. Once this stage is reached, get in sync with the landlord’s emotions and you may get what you need. Another definite clear sign is the presence of incentives. If you find that a landlord is willing to throw in some incentives to have you secure and sign the lease, well it is a win-win situation for both of you, and even more for you. Such incentives include offering free internet, free and good parking spaces, even free rent for a certain set of period. These are landlords who know that they have to offer some incentives to secure a tenant not just because they need the income, but because they also have to compete with rival landlords. As such, the aforesaid situation his is a clear sign that the owner knows the market as well as the competition. Now this is what is commonly called ‘a tenants’ market’. However, if you really have no need for the extra stuff that is being offered, you may also wish to negotiate for even lower rents due to not needing the incentives offered. On that note, these are some of the ways in reading landlords’ behaviour to spot excellent rental opportunities. However, keep in mind that real estate is a cycle. This situation may happen now, but there is also a tendency for a ‘landlords’ market’; where landlords have the upper hand in negotiations. Nevertheless, for both parties, mutual respect is required in order to ensure an excellent business, personal and profitable rapport.